The Sadistic Personality Disorder made its last appearance in the DSM III-TR and was removed from the DSM IV and from its text revision, the DSM IV-TR. Some scholars, notably Theodore Millon, regard its removal as a mistake and lobby for its reinstatement in future editions of the DSM. The Sadistic Personality disorder is characterized by a pattern of gratuitous cruelty, aggression, and demeaning behaviors which indicate the existence of deep-seated contempt for other people and an utter lack of empathy. Some sadists are "utilitarian": they leverage their explosive violence to establish a position of unchallenged dominance within a relationship. Unlike psychopaths, they rarely use physical force in the commission of crimes. Rather, their aggressiveness is embedded in an interpersonal context and is expressed in social settings, such as the family or the workplace. This narcissistic need for an audience manifests itself in other circumstances. Sadists strive to humiliate people in front of witnesses. This makes them feel omnipotent. Power plays are important to them and they are likely to treat people under their control or entrusted to their care harshly: a subordinate, a child, a student, a prisoner, a patient, or a spouse are all liable to suffer the consequences of the sadist's "control freakery" and exacting "disciplinary" measures. Sadists like to inflict pain because they find suffering, both corporeal and psychological, amusing. They torture animals and people because, to them, the sights and sounds of a creature writhing in agony are hilarious and pleasurable. Sadists go to great lengths to hurt others: they lie, deceive, commit crimes, and even make personal sacrifices merely so as to enjoy the cathartic moment of witnessing someone else's misery. Sadists are masters of abuse by proxy and ambient abuse. They terrorize and intimidate even their nearest and dearest into doing their bidding. They create an aura and atmosphere of unmitigated yet diffuse dread and consternation. This they achieve by promulgating complex "rules of the house" that restrict the autonomy of their dependants (spouses, children, employees, patients, clients, etc.). They have the final word and are the ultimate law. They must be obeyed, no matter how arbitrary and senseless are their rulings and decisions. Most sadists are fascinated by gore and violence. They are vicarious serial killers: they channel their homicidal urges in socially acceptable ways by "studying" and admiring historical figures such as Hitler, for instance. They love guns and other weapons, are fascinated by death, torture, and martial arts in all their forms. In broad strokes, there are two types of sadists: the Monster and the Monk. We are all acquainted with the first type, the habitué protagonist of horror films, as described above, in this article. Far less known and acknowledged is the Monk-sadist. He tortures people by confronting them with a personal example of unparalleled and unsurpassed morality, rectitude, virtue, asceticism, and righteousness. His saintly conduct is intended solely to inflict pain by allowing him to criticize, berate, and chastise from a position of high moral ground. His soapbox is his weapon as he poses and imposes impossible demands and untenable standards of behavior, setting up his victims to failure and humiliation. Having thus secured their fall from grace, he then proceeds to harp on their shortcomings, errors, peccadilloes, and vulnerabilities, labelling them "moral turpitude" and "decadence". He dispenses punishment with relish and basks in the agony and writhing of his flock, charges, or interlocutors. 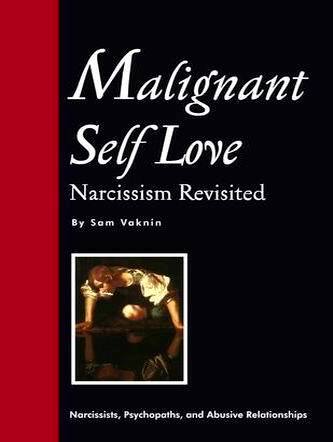 The Narcissist as a Sadist - Click HERE!